Most of you will have already read my January, 2009 article on the basics of shoulder dystocia and are familiar with the most common type of dystocia, or impediment to the delivery of a baby, where the anterior shoulder of the baby becomes lodged behind the pubic symphysis at the front of the mother’s pelvis. This is called anterior shoulder dystocia and accounts for the vast majority of dystocia cases I see litigated by my clients. If you are familiar with anterior shoulder dystocia, you have a great foundation, but there are other types of dystocia and other topics associated with this issue that I will cover in this article. This will provide you with a more advanced understanding of what you may encounter in future obstetrics malpractice cases. Unlike anterior dystocia, where the anterior shoulder of the baby becomes lodged, in posterior shoulder dystocia the shoulder of the baby that is closest to the mother’s spine or sacrum is the one that becomes stuck. 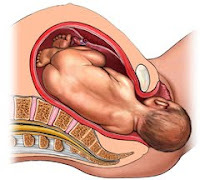 Generally, this posterior dystocia occurs when the posterior shoulder of the fetus becomes lodged on the protruding sacral promontory, which is the upper lip of the sacrum at the base of the lumbar spine. Also, I have seen one case that involved a mother with an unusually curved coccyx, tailbone, on which the posterior became stuck. Either way, the point is that posterior shoulder dystocia, while rare, is possible, so you should be sure of the facts before you assume your case involves the more common anterior type. Another issue that arises in many of these shoulder dystocia cases is the actions taken by the healthcare provider that might exacerbate the situation. While attempting to dislodge an infant that is not progressing there are many things that should not be done, but in my experience there are two mistakes most commonly associated with brachial plexus nerve injuries. The first is excessive traction or pulling on the baby’s head, especially traction in which the head is pulled downward away from the lodged shoulder. This traction can be done with the hands, with a vacuum extractor or with forceps, and while some traction is necessary in many births, excessive traction in cases of shoulder dystocia can lead to devastating nerve injury. The second issue is fundal pressure. This is when a nurse or assistant pushes down on the upper part of the mother’s abdomen in an attempt to force the baby out. Once again, in cases where the shoulder is stuck, this force can lead to nerve injury. Force is the issue whether it is pulling force or pushing force. If the shoulder is stuck, it must first be dislodged before labor can progress. Although downward traction and fundal pressure are maneuvers that should be avoided, there are several acceptable maneuvers that can often release the shoulder of the infant. Of all of these, some so desperate that they include fracturing the collar bone of the fetus, there are three that we so most frequently in these cases. The first is called the McRoberts maneuver. This is simply the elevation of the mother’s legs with the knees forced back toward the abdomen. This flexion of the hips causes a substantial change in the angle of the pelvic outlet that can often allow for more easy passage of the infant. Next, there is suprapubic pressure. In this maneuver, a nurse or assistant presses down on the lower abdomen directly above the mother’s pubic bone providing direct pressure on the baby’s shoulder and hopefully dislodging the dystocia. Finally, there is the Woods corkscrew maneuver. This maneuver involves the insertion of the doctor’s fingers into the vaginal canal just behind the baby’s posterior shoulder. Then, with gentle pressure, the shoulder can be rotated in a corkscrew fashion turning the baby into a more horizontal orientation and releasing the anterior shoulder from behind the pubic symphysis of the mother.